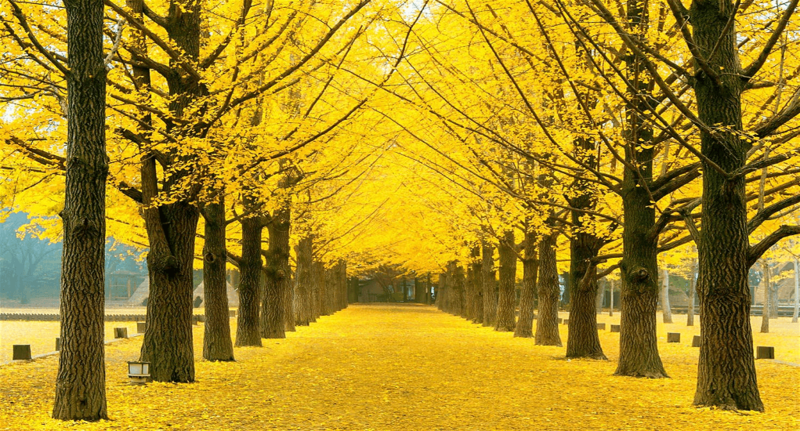 When people are coming to Korea, they usually include Nami Island trip in their itinerary. 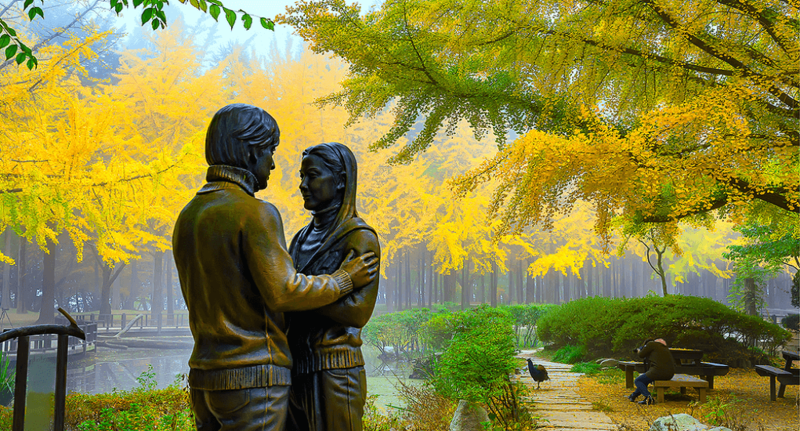 If you are familiar with some of the Korean dramas, such as Winter Sonata or Goblin, then you may want to visit the small island. The place isn’t only popular for its background in movies but also for the beautiful and scenic views. Known as Namiseom, the small island is located only 63 kilometres away from Seoul. When the Korean government constructed Cheongpyeong Dam, a half moon shape island was created along the way. You can also find the grave of General Nami, one of the Korean brave generals during the Joseon Dynasty who gained a great victory against the rebels. One of the signature characteristics of the island is the tree-lined roads. If you have seen Winter Sonata, then you know what I’m talking about. Besides tree-lined beauty, you can also enjoy other scenic beauties. The island isn’t far from Seoul. It is about 60 minutes from Seoul’s suburbs and it is only 30 minutes from Chuncheon. Because of the close proximity, the island is often visited by couples and even families. There is a wide grass field covering more than 300,000 square yards with training facilities, educational facilities, and also camping sites. If you are into water sports, you will find the complete facilities there, including water skiing, motorboats, and swimming pool. Kids will definitely have fun with the theme park and even roller skating rink. If you want to take part in interpretation services, there is the Naminara Story tour that takes place at 11 AM on a daily basis. The tour lasts between 30 minutes to 60 minutes. The language is offered in 3 types: Chinese, Japanese, and English. The available spot is only for 20 people and it requires a reservation. If you want to spend the night there, bungalows and resort villas are ready to accommodate you. Basically, you can enjoy the crafting, pottery, or glass blowing classes as well as the playground activities. If you want to shop, there are gift shops and craft shops all over the island. It is recommended to come to the island in May, October, and in between July and August. If you want to join the programs, make sure that you have read the terms and conditions. Different programs have different age limits. Moreover, you are allowed to bring pets but only if they are on a leash and less than 7 kilograms. Since the island is pretty small, you can always explore it on foot. However, if you want to save up time and energy, you can use some of the available means of transportation. There are UNICEF Charity train, tri-way electric bikes, Story tour bus, or Sky bike – feel free to use them all if you have Nami Island All Pass. The same pass also allows you to get into Forest Adventure Treego. If you buy the pass, it will only cost you 45,000 won – and you can enjoy everything. If you buy the tickets individually, the total spending can reach 105,000 won. You can reach the island in two major ways. You can use the ferry or you can use the zip line. Be advised, though, that the zip line is only available for one way. When you want to leave the island, you still need to use the ferry. Take the ferry from one point of Gapyeong Ferry Wharf. There is always one available in every half an hour from 7.30 AM to 9 AM. From 9 AM to 6 PM, expect to find one in every 10 to 20 minutes.